REVENGEANCE FRIDAY NIGHT SDCC- MATTHEW MODINE! REVENGEANCE will be screening at the San Diego Comic-Con on FRIDAY NIGHT 10:35 PM. Admission is FREE with SDCC BADGE (yes you need those stinkin' badges)! JUST ANNOUNCED: Matthew Modine (one of the the film's producers) will be there to help introduce the film, alongside Bill Plympton and Jim Lujan! BE THERE!! 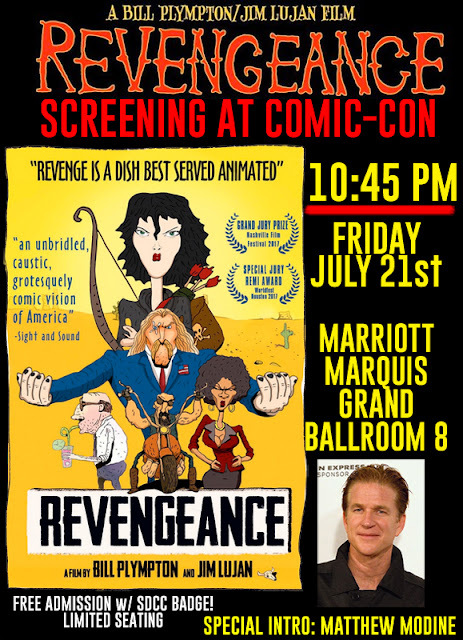 Revengeance screening at San Diego Comic-Con! Friday, July 21 at 10:35 pm at the Marriott Marquis next-door to the convention center, we're going to be screening the full REVENGEANCE film. Introduction by Bill Plympton and Jim Lujan. Admission is free with a comic con badge. Limited seating so get there early! This is going to be one wild and fun sneak peek!